With attention on the Federal Reserve's decision to increase rates and their updated outlook for 2019, we wanted to share an article today that CNBC published (included below). As we wrote in our commentary after the Fed's press release on Wednesday, we believe the Fed and Powell were (1) buying themselves time - and the ability to review the data that will come in that time, and (2) leaving the door wide open to reduce the number of rate hikes they may do in 2019 without closing the door on future rate hikes should the economy's growth rate increase. New York Fed President William's comments in the article below support our interpretation of Powell's press release. The reaction to the news today is irrational. The S&P 500's earnings growth for the third quarter of 2018 came in above 28%, and the most recent expectation of fourth quarter 2018 growth is +16%. Further, ALL ELEVEN SECTORS OF THE S&P 500 EXPECT TO SEE GROWTH. The behavior of the stock market is not commensurate with the growth that is happening. For all the talk of recessions and bear markets, earnings data has not provided a case for bear markets or the talk of recessions. As we've shared previously, earnings are still growing, and the most current outlook is that they will continue to grow. Further, valuations look very attractive. Forward earnings estimates show the S&P 500 now trading below 16 times earnings. If the market were to trade back to its average price to earnings ratio from 1971 until today, the S&P 500 would have to increase over 20%. New York Fed President John Williams says the central bank is open to rethinking rate hikes next year, depending on how the economy looks in 2019. "What we're going to be doing going into next year is reassessing our views on the economy, listening to not only markets but everybody that we talk to," Williams tells CNBC. He also says things could "change between now and next year," depending on economic data. Earlier this week, the Federal Reserve hiked its target range for benchmark interest rates to 2.25 percent to 2.5 percent. Central bank officials also forecast two hikes next year, down from three rate raises previously projected. Federal Reserve Bank of New York President John Williams told CNBC on Friday the Fed is open to reconsidering its views on rate hikes next year. "We are listening, there are risks to that outlook that maybe the economy will slow further," Williams told Steve Liesman during an interview on "Squawk on the Street." Williams said despite this week's forecasts, the central bank is not "sitting there saying we know for sure what's going to happen" in 2019. "What we're going to be doing going into next year is reassessing our views on the economy, listening to not only markets but everybody that we talk to, looking at all the data and being ready to reassess and re-evaluate our views," he said. The market jumped after Williams signaled more willingness for the Fed to rethink rate hikes and its balance sheet policy. Stocks jumped 350 points after the interview. Investors were focused on Fed Chairman Jerome Powell's comments on Wednesday that the balance sheet reduction program is going well and will proceed as planned. Right now, the Fed is allowing $50 billion a month to run off the balance sheet, which is mostly a portfolio of bonds the central bank purchased to stimulate the economy during and after the financial crisis. "We did not make a decision to change the balance sheet normalization right now, but as I said, we're going to go into the new year with eyes wide open, willing to read the data, and reassess the economic outlook and take the right policy decisions," Williams told CNBC. The Federal Reserve on Wednesday hiked its target range for benchmark interest rates to 2.25 percent to 2.5 percent. Central bank officials also forecast two hikes next year, down from three previously projected. Williams said the Fed could could rethink those the two hikes. "Things can change between now and next year," he said. "Something like two rate increases would make sense in a really strong economy going forward. But we're data dependent, we're going to adjust our views dependent on how the outlook changes." Powell also left the door open to other options next year. He emphasized "data dependency" on Wednesday and said if data do not hold up in 2019, the Fed may change course. Markets stumbled up and down after the decision Wednesday, then ultimately turned negative during Powell's news conference. Major equity indexes have moved into correction territory and are mostly negative for the year. "The Fed wants to shrink that balance sheet, they know it's big, it hamstrings them in the next downturn," Peter Boockvar, chief investment officer at Bleakley Advisory Group, told CNBC. "The market knows it's a steady drip liquidity drain every month." The Fed is also dealing with repeatedly criticism from President Donald Trump. On Monday, Trump said "it is incredible" that "the Fed is even considering yet another interest rate hike." — CNBC's Jeff Cox and Patti Domm contributed to this report. Is there any reason to remain optimistic? ﻿The markets are giving investors a rational reason to remain optimistic, but with investors' focus on the Fed's statement yesterday (and their interpretation of what they think it meant) seems to be clouding their vision. 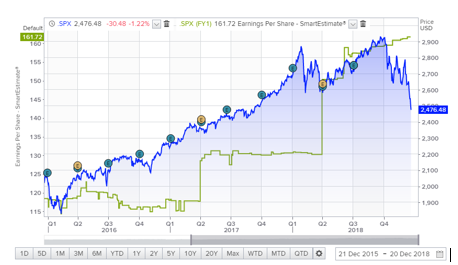 The chart below shows the S&P 500's earnings per share (green line), which is what ultimately moves the stock market (blue line)higher or lower. Looking over the last three years, we've seen consistent, stable earnings growth. In early 2018, we can see the dramatic increase in earnings created by the new tax plan. More importantly, since the the tax plan went into effect, we can see a stable and steady increase in earnings has been maintained. ﻿Interestingly, since the market peaked in late September, earnings have continued to grow, but the stock market has contracted sharply, and the S&P 500's forward PE ratio has dropped to 16 times earnings. Equity indices across the board are dropping into "corrections" (greater than 10% drop), and some are approaching bear market territory (greater than 20% drop), which is usually only experienced during a recession. Others are blaming a sharp drop in earnings; the problem is that earnings have not yet dropped, and are not forecast to drop. Thomson Reuters produces an earnings tracker for the S&P 500, and in their most recent data, earnings are expected to increase 15.9% in the fourth quarter of 2018 and another 5.6% in the first quarter of 2019. At first glance, the 5.6% growth in Q1 2019 may seem anemic, but considering the level of earnings achieved through the tax cuts, it's actually quite impressive. Further, growth is projected to increase to nearly 12% by the end of 2019. This is hardly the outlook of a recession or long term bear market. Looking back over the last few years, this is not the first fear based reaction investors have been through. From July, 2015 through February, 2016, the S&P 500 was in a downturn. It corresponded with a drop in earnings that started in October, 2014. As we followed the data then, we observed that earnings we predominantly lost in the Energy Sector as oil (brent crude) traded down from more than $110 / barrel at the end of 2013 to less than $50 / barrel in 2015. Because a drop in oil prices is a natural stimulus to the rest of the economy (and stock market), the rest of the economy did well. The earnings and jobs that were lost in the energy sector were more than made up for in other sectors of the market, and both the economy and the market ultimately followed earnings in an upward path. ﻿After a disappointing 2015, the earnings continued climbing and S&P went on to return 12% in 2016 and another 22% in 2017. The challenges the market faces today appear less challenging than what was faced in 2015. Despite various companies (and some sectors of the economy) facing headwinds from trade negotiations or other issues, earnings continue to climb. Because it's hard to see in the chart above, we'll mention that long before the markets came under extreme pressure in October 2008, earnings began to erode, and in fact, provided more than 6 months of advance notice to the dramatic market drop in October 2008. 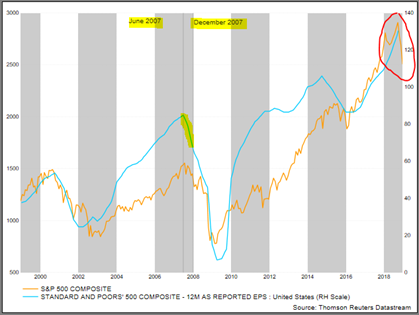 Earnings actually peaked in June 2007 and fell steadily through the beginning of 2019. Today, unlike 2007, we have yet to see a drop in earnings, or any other metric that would indicate a recession lays ahead. Rather, we are watching earnings climb while the stock market drops. The economic data also contradicts what the stock market is doing. Employment and wages remain strong. Consumer sentiment and consumption is strong. Consumers debt burdens are considerably lower than they have historically been prior to a crisis, and the list goes on. Looking back to the first chart, and the impact earnings ultimately have on the stock market's price, investors who did not panic sell in February, March, and April were rewarded. We believe that will happen again. Looking to next quarter, if earnings continue their ascent, it is difficult to build an argument for why stocks would not rebound. Please call us or email us with any questions. As was widely expected, the Fed raised the Federal Funds Rate 0.25%, bringing it to 2.5%. The press release shows a balance of demonstrating a willingness to ease the previously outlined path of interest rate hikes and a desire to avoid giving the unintended impression that they view the economy as weak. Rather than stating today that there will be no rate hikes next year, their outlook changed from an expectation of 3 rate hikes to 2 potential rate hikes next year. In their statement, they said, "Information received since the Federal Open Market Committee met in November indicates that the labor market has continued to strengthen and that economic activity has been rising at a strong rate. Job gains have been strong, on average, in recent months, and the unemployment rate has remained low. Household spending has continued to grow strongly, while growth of business fixed investment has moderated from its rapid pace earlier in the year. The Fed is clearly aware of the potential impact from a slowdown in Capital Expenditures. The drop from the market's highs today after the Fed's press release suggests many investors don't believe the Fed's position on slowing the pace of future rate hikes was a strong enough statement. We believe they are missing the Fed's message. By reducing the number of expected rate hikes next year from 3 to 2, the Fed has essentially given itself more time to observe more data before making a decision to raise rates again. With the path of 3 rate hikes next year, it was widely expected that the Fed would be raising rates in the first quarter of 2019, however with only two expected increases next year, the Fed can easily hold off on any further action until June or July. This will allow time to observe wage growth, employment growth, consumer spending, capital expenditures, etc. Additionally, the Fed said today "that risks to the economic outlook are roughly balanced, but they will continue to monitor global economic and financial developments and assess their implications for the economic outlook." The Fed is laying the groundwork to delay rate hikes in 2019 if either US or Global market conditions do not continue to accelerate. They gave further clarity to their position saying, "In determining the timing and size of future adjustments to the target range for the federal funds rate, the Committee will assess realized and expected economic conditions relative to its maximum employment objective and its symmetric 2 percent inflation objective." We have heard the Fed reiterate over the last year that it is surprised we have not seen higher levels of inflation. We have also observed a lower wage growth than expected. Essentially, based on current data and the Fed's statement, they already have the argument in place not to raise rates again, unless and until they see higher inflation and higher wage growth. Looking back to how the Fed communicates and operates, we thought it would be helpful to review their path to raising rates back in 2015. In Janet Yellen's press conference on March 18, 2015, she reaffirmed that the Fed had voted to maintain its target rate at 0 to 0.25%, but also said, "With continued improvements in economic conditions, however, we do not want to rule out the possibility that an increase in the target range could be warranted at subsequent meetings." To temper her statement, she said, "Let me emphasize, however, that the timing of the initial increase in the target range will depend on the Committee's assessment of incoming information." The Fed ultimately did raise interest rates, nine months later, at its December press conference. They allowed the idea to set in, and then over the remainder of the year, they provided the data points that would indicate to them the time had come. We highlight this because we see the Fed's behavior in 2015 as being very similar to the Fed's behavior under Powell. The Fed shared the data it followed and it remarked on what the data meant in terms of the Fed's future actions. After reporting that the Fed's various targets had been achieved, it finally began raising rates. Three weeks ago, as some global economic data started to show signs of slowing, Fed Chairman Powell commented that he though interest rates were "near neutral." The significance of neutral rates is that once rates are neutral, the Fed no longer needs to continue raising them. Then in today's press release, the Fed highlighted that they still continue to see a great deal of strength in the US economy, but that they did observe weakness in Capital Expenditures. To this observation, they added the that future rate increases would be dependent on the reaching of "expected" economic targets; some of which we know have not yet been met. Powell is creating the path to either stop raising rates or to continue, should economic data justify the action. He is giving insight into what they are watching, and what they view positive and negative developments. At Powell's next press conference, we anticipate he will again report on the positive and negative data the Fed observes. If the data continues to weaken , we expect Powell to further reduce or delay future rate increases. The way in which the Fed communicated today is healthy for the markets. Sudden and dramatic shifts in policy can undermine confidence in the markets, whereas consistent, thoughtful actions have proven to be beneficial to the market.